Make it 6 straight. Putting Denis in net made no difference. We just saw the difference between an average team and an elite team. (AP) -- The Detroit Red Wings played a game of keep away. And while they had the puck, Jiri Hudler had a goal and an assist to help Detroit beat the Tampa Bay Lightning 4-2 on Thursday night. Pavel Datsyuk, Tomas Kopecky and Dan Cleary also scored, and Chris Osgood made 21 saves for the NHL-leading Red Wings. 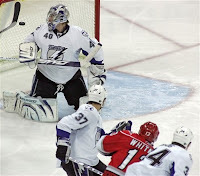 Brad Richards and Mathieu Darche scored for Tampa Bay, which lost its sixth straight. Marc Denis stopped 35 shots. "This is a good team. Puck possession-wise, they killed us," Tampa Bay's Martin St. Louis said. "It's a tough way to play when you don't have the puck against a good team like that." The Bolts have now dropped 5 in a row (0-4-1), this time to former goalie Nikolai Khabibulin and the Chicago Blackhawks. The Hawks got on the board early and never looked back. Martin Havlat had 2 goals in his first game back after missing 22 with a shoulder injury. His 1st was just 43 seconds in, and it set the tone for the rest of the game. The Bolts defense was caught out of position numerous times yielding the 5 goals, and Holmer was replaced by Denis to start the 3rd period, but that didn't make a difference. Holmqvist surrendered 3 goals on 10 shots, Denis gave up 2 on 7. "We haven't been playing that bad during this hiccup," Denis said. "But tonight was a stinker. We need to find ways not to get behind the 8-ball like we have been." The Lightning's lone goal came in the 3rd on a power play goal from Nick Tarnasky. 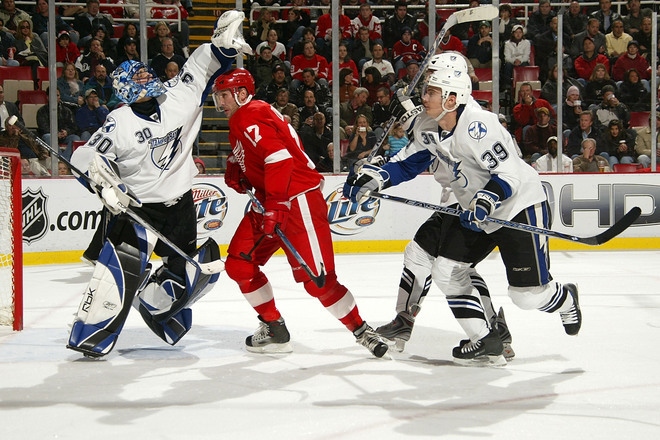 The Lightning now head to Detroit to face a tough Wings team in the 2nd of back-to-back games. The deal Absolute Hockey Enterprises was hoping to put together to buy the Lightning from Palace Sports & Entertainment apparently is dead. Palace Sports nixed the purchase agreement when Absolute Hockey did not come up with a required $5-million payment. Now the investment group has splintered as Coral Springs real estate developer Jeff Sherrin is suing Hollywood producer Oren Koules for allegedly failing on Nov. 13 to make a capital contribution of $4.16-million. Sherrin is asking $50-million in damages. The suit was filed in the 13th judicial circuit in Hillsborough County. The other known members of the investment group are Mark Burg, Koules’ business partner, former Blue Jackets president Doug MacLean and Tampa attorney Steve Burton. While the deal as originally announced with much fanfare on Aug. 7 is no longer valid, don’t be surprised if a deal is resurrected at a later date with Koules or a group led by him. Koules has a minor hockey background and always expressed his interest most fervently. He said shortly after the sale was announced that he already had depth charts on his desk in Los Angeles. But that apparently is not something that will happen quickly. The bombshell is another blip in a process that has been anything but smooth. At the news conference announcing the original sale of the team, the St. Pete Times Forum lease and 5½ acres of adjacent land for about $200-million, the group said it would announce the rest of the investment group in a week to 10 days. But names were difficult to come by, and while Berg and Burton were brought on board, MacLean always maintained at least one other investor had yet to be named. Absolute Hockey said repeatedly it hoped to close the deal by the end of November. There also was a Dec. 31 deadline in the purchase agreement to finalize the transaction. But when the deal did not make it onto the agenda of NHL Board of Governor’s meeting Wednesday and Thursday in Pebble Beach, Calif., it was obvious the deal was not progressing as quickly as hoped. Yet another streak. Will this team ever be a "normal" team? In losing to New Jersey, the Bolts added to their current streak, a losing one, totaling 4 games. The Bolts got goals from Jason Ward and Vinny Lecavalier, but it wasn't enough. Gionta netted 2 for the Devils, and Brodeur was in top form stopping 34 of 36. The Bolts hit the road to face Chicago and Detroit on consecutive nights. (AP) -- Nothing was going right for the Carolina Hurricanes, not in this game and certainly not this season against the Tampa Bay Lightning. Everything changed with one brilliant stretch of hockey. "We knew that we hadn?t played our best," Carolina defenseman Glen Wesley said. "We knew we had to go out there and not play in our heels." And Wesley, of all people, came through with the game-winner, capping a huge third-period comeback with his first goal in more than nine months to help Carolina beat the Lightning 4-3 Friday night. Down 3-1 entering the final 20 minutes and headed toward another lopsided loss to their Southeast Division rival, the Hurricanes scored three goals in less than 7 minutes to beat Tampa Bay for the first time this season. Vincent Lecavalier, the league's top scorer, padded his lead with a goal and an assist, and Vaclav Prospal and Paul Ranger also had goals for the Lightning. "We got what we wanted for 40 minutes," Lecavalier said. "They've got a good veteran team, and they put it together in the third." I just got back from Dallas, and while I was gone, a few things have transpired that have my temperature gauge soaring. The big numero uno on the list is the release of Bryzgalov by the Ducks. This has me completely miffed. 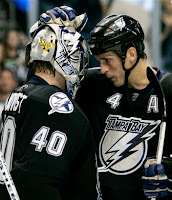 It is blatently obvious that the Bolts need a quality, steady and dependable #1 in net. Although Holmqvist has shown flashes of greatness, he has also shown that he is very streaky and inconsistent. Bryzgalov has a proven playoff record, and is rated by most to fall into the "elite" range of NHL net minders. So why is he not in Tampa? Why is he playing out in Phoenix? It is obvious that his service could have been obtained from Anaheim for a song and a dance, or in hockey terms, a very low draft pick, so what happened? Who knows. But I'll tell you one thing, if I hear that stupid "can't do any deals while the sale is pending" BS I'm going to go postal. How is adding half of Bryzgalov's $900k of remaining salary a detriment to the team's sale? I'm sorry, I thought the Absolute Hockey group was buying a high quality cup contender. I guess that's what I get for thinking. This goes beyond excuses to what I believe is stubbornness. Feaster brought in his flop of the century in Marc Denis, a player he had a history with from his days in Hershey, and is still hoping to make out on the positive in that deal. Guess what...ain't gonna happen. Nobody, not even your head coach wants they guy. He should have grabbed Bryz, sent Denis down, swallowed his pride, and set this team up for a legitimate cup run. Instead we are going to continue to see what happened last night against Atlanta, a goalie in Holmqvist that at times looks brilliant, and at others down right pathetic. If this season goes the way of last year with another first round exit, Feaster needs to be held accountable. With the Big 3 in the prime of their career, there is only so long a window of opportunity will remain open. Without that #1 in net, that window will be closing sooner rather than later. The Lightning and Stars traded minor league D men. The Lightning sent Bryce Lampman to the Stars in exchange for Mario Scalzo. Scalzo is a smallish defenseman at 5-9, 187. He has an impressive Junior hockey resume including making the 2004-05 Memorial Cup All-Star Team, being named the 2004-05 QMJHL Emile "Butch" Bouchard Trophy Winner (Best Defenceman), and 2004-05 QMJHL First All-Star Team. (AP) -- Todd White has two of Atlanta's five goals in overtime. Such are the blessings of playing center on a front line with Ilya Kovalchuk and Marian Hossa. "I don't know what it is about overtime," White said. "But I told them I was good for one (winner) a year. This makes two. I don't know." White scored a power-play goal with 2:11 left in OT to give the Thrashers a 4-3 victory over the Tampa Bay Lightning on Monday night. Kovalchuk had his NHL-best 17th goal for the Thrashers, who withstood another terrific effort by Vincent Lecavalier to earn their third straight win. Lecavalier had a goal and an assist for the Lightning to extend his multipoint streak to eight games, longest in the NHL since Jaromir Jagr had 10 straight for Pittsburgh from Feb. 18-March 9, 1996. The talented center leads the league with 34 points. Kovalchuk tied it at 3 with a wrister with 2:23 left in regulation, and helped set up White's winner in overtime. "Todd looks like a 60-goal scorer out there," Kovalchuk said. "His first overtime goal was top shelf and this one (went) low." The Lightning led 3-1 on Martin St. Louis' eighth goal with 9:30 left in the third, but Bryan Little's third goal, coming 4 minutes later with Atlanta on a two-man advantage, made it 3-2. Tampa Bay coach John Tortorella wasn't exactly pleased with the holding call on Brad Richards, which gave Atlanta an easier chance to start a comeback. Unleashing a profanity-laced tirade after the game, Tortorella couldn't mask his anger. "The frustrating part to me is that these organizations pay players millions upon millions of dollars, and they are the ones who should decide the outcome of games," Tortorella said. "They are the show. I'm trying to stay away from criticizing calls, but (to heck with that). I don't get it. It makes the coach's job just that much harder -- how do you prepare players when you get that (kind of call) out there? There's a disconnect somewhere. There's something obviously wrong with this game." AP - Johan Holmqvist and Vincent Lecavalier helped the Lightning overcome a sluggish performance for their fifth straight victory. Holmqvist made 28 saves, Lecavalier had a goal and two assists to extend his team record for consecutive multi-point games to seven and Tampa Bay beat the Washington Capitals 5-2 on Friday night. (AP) TAMPA, Fla. - Vincent Lecavalier turned a slow start into a dominating performance. Lecavalier had three goals and two assists to set a team record with his sixth consecutive multi-point game, leading the Tampa Bay Lightning past the Carolina Hurricanes 6-1 on Wednesday night. Lecavalier scored twice and also assisted on goals by Paul Ranger and Martin St. Louis during a five-goal second period that put the Lightning ahead 5-0. The centre, who has five goals and 11 assists over his past six games, completed the hat trick with a short-handed breakaway goal with 5:09 remaining in the third. "I couldn't find him in the first period," Tampa Bay coach John Tortorella said. "It's unbelievable how he played in the second period." Johan Holmqvist made 28 saves for the Lightning, who have won four in a row after a six-game skid. 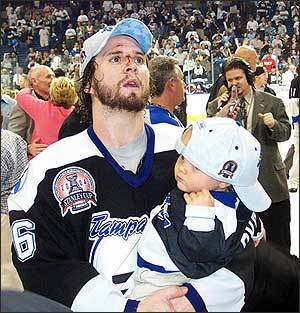 Tampa Bay also got a goal from Vinny Prospal. (AP) -- Capitals goalie Olaf Kolzig was infuriated by the three goals he allowed in the third period against the Lightning. Kolzig gave up two goals in a span of 58 seconds during the final 20 minutes and Tampa Bay beat Washington 5-2 on Saturday night for its second road victory of the season. "We're not going to go anywhere if we continue to play like that," Kolzig said. "We made a point of it before the game to start putting some points together at home. We're awful at home right now. We can't get it done and the third period was a prime example of that." Vaclav Prospal had a goal and two assists, Martin St. Louis added a goal and an assist, and Vincent Lecavalier had two assists for the Lightning, who won on the road for the second straight game after losing their first seven road contests. The Lightning beat the Southeast Division-leading Carolina Hurricanes 5-1 on Thursday night. "We played really well defensively and it feels great to get some wins back," Prospal said. "We had a lot of chances in the second period but didn't get any behind their goaltender." The third period was another story. St. Louis' 10th goal of the season came from the right wing and gave the Lightning a 3-1 lead 2:27 into the third period. Prospal and Brad Lukowich assisted on the play. "We've talked about it enough the last couple of weeks," Kolzig said. "It all comes down to individuals knowing what they have to do and that's it. If you need somebody else to tell you to get motivated, you're probably in the wrong league." Less than a minute earlier, Prospal's goal gave Tampa Bay a 2-1 lead. From in front of the net, Ryan Craig deflected Prospal's shot from the right wing and scored a power-play goal for a 4-1 lead with 7:38 remaining in the game. "If you have your power-play unit playing well, like tonight, you can steal away some games," Prospal said. Paul Ranger closed the scoring with an empty-net goal with 21 seconds remaining off an assist by Brad Richards. "Chances were hard to come by and we needed to keep our patience," Lightning coach John Tortorella said. "Getting a couple in the third period with a few good face-offs was key." Alex Ovechkin's 11th goal of the season and his 11th in 18 career games against the Lightning tied the score at 1-1 with 1:40 left in the second period. Ovechkin took a crossing pass from Mike Green and juked to send goalie Johan Holmqvist sprawling in front of the net. Green then beat him top shelf. Holmqvist finished with 23 saves. "He has been solid," St. Louis said. "When he plays like that, I like our chances." The Lightning finally have the monkey off their back. Last night they ended their losing streak, tonight the ended their road losing streak. Thanks, in no small part, to the 40 saves registered by Johan Holmqvist. Holmer was 3-1 with 1.80 GAA, .930 save pct. against Carolina coming into tonight's game, and he left with another notch in the win column. The Bolts got first period goals from Vinny Lecavalier and Shane O'Brien to set the pace for the Lightning. Keeping the Hurricanes under control, and chipping away, Torts changed up the lines and put Ouellet out with Lecavalier and Prospal. That's when the flood gates opened. Ouellet has been on a mission the past few games, and this one was no exception. He had a relentless forecheck, and his play led to both the Bolts first period goals. The second period saw the Lightning tally two more times, the first only 2 minutes in by Filip Kuba, and O'Brien got his second of the game just before the end of the period. Holmqvist stopped all 18 shots the Canes threw at him, and the Bolts went in up 4-0 after two. In the third the Hurricanes got on the board with a goal by Ray Whitney early in the frame, but again, it was Holmqvist to the rescue. He turned away 14 of 15 in the third, and Vinny Prospal added a power play goal midway through the third to seal it for the Bolts. The Lightning head on to face the Ovechkin and the Capitals Saturday in D.C. The streak is over! After 6 consecutive losses, the Bolts returned to the Forum and brought home a win. The Bolts got 1st period goals for Mary St. Louis and Jan Hlavac, and an empty netter from Vinny Lecavalier in the 3rd to seal the deal. Holmqvist was solid in net. He made several key saves down the stretch that helped preserve the Bolts lead. He finished with 22 saves on 23 shots. There will be no time to celebrate as the Lightning hit the road to face divisional foe Carolina in their 2nd game in as many nights. The Lightning will now be without defenceman Dan Boyle for an indefinite period of time after an MRI showed the injured wrist requires additional surgery. Boyle cut three tendons in his left wrist on September 22nd and recovered well enough to get back into the lineup last week. But the wrist is bothering him, so the MRI was done and revealed that two of the three tendons severed have not properly healed. "In light of the medical findings on the MRI yesterday, it is important to note that over the course of the four games he played, Dan may have done so having only one of the three tendons fully intact,'' said Feaster. ''That he played, and played as many minutes as he did at such a high level of performance, is a testament to the fact that he is a warrior who consistently puts the team first. Having watched how hard he worked rehabbing earlier and knowing how badly he wants to be out there playing, we are confident that he will once again do everything possible to rejoin the team as quickly as he can." Matt Smaby has been recalled from Norfolk to fill the void on defense. It's beginning to get old. The Lightning outplayed the Panthers in the 2nd and 3rd periods, outshooting them 20-17, but come away with another loss. They play hard, win the battles, get the shots on goal, but in the end come up empty. The Bolts got goals from St. Louis(3pp), Lukowich(1), and Ouellet(4), but they weren't enough to overcome the "Curse of Sunrise", a curse that has seen the Lightning drop 9 of 10 on the Panthers home sheet of ice. This time the loss was the Bolts 6th in a row and 7th consecutive on the road. Of note, Ouellet seems to have found his stride, he tallied the Bolts 3rd goal, and was strong on the puck and along the boards. Lecavalier was awarded the games 3rd star for his 2 assists. The Bolts were assessed three 5 minute major penalties, one a weak call to Prospal for boarding, and two to Tarnasky one for boarding and one for fighting. He also earned a game misconduct, but got a nice shot in on Allen through a ref's grip, that dropped the Panther defenseman to the ice. Lightning Goaltender Johan Holmqvist had 26 saves on 30 shots. The Lightning return home Wednesday to face the Panthers for the back end of a home-and-home. (AP) -- The Atlanta Thrashers may have turned it around after a dismal start. Pascal Dupuis scored the go-ahead goal late in the third period and Ilya Kovalchuk had his second consecutive three-goal game, helping the Thrashers rally for a 6-4 win over the Tampa Bay Lightning on Saturday night. Dupuis put Atlanta ahead 5-4 from the low slot off a pass from Bryan Little with 2:08 left. Kovalchuk, who had a hat trick in Thursday night's loss to Ottawa, completed another three-goal performance with an empty-net goal with 1:22 to play. "When you're in the NHL, you never know what's going to happen," Kovalchuk said. "It was unbelievable. It was a great feeling." The Thrashers battled back from a three-goal second-period deficit, tying it 4-all when Kovalchuk scored his second goal of the game from the left circle at 7:21 of the third. Kovalchuk has four goals in three games against Tampa Bay this season after scoring just once in eight games with the Lightning last season. "He's going as good as I've seen him go," Atlanta general manager and interim coach Don Waddell said. "This is outstanding." Atlanta had three goals on five shots in the final period. Thrashers rookie Ondrej Pavelec, who made his first career NHL start and third appearance overall, had 11 of his 30 saves in the third. "I'm not making any assessments," Tampa Bay coach John Tortorella said. "It's what it is. Three goals on five shots. We pounded away chance after chance and couldn't score. They come down and score." Lightning goalie Johan Holmqvist allowed five goals and 21 shots. They say defense wins championships. And the Bolts defense has not been good, that is, aside from their 1st line. After looking at the teams stats, some of the problems really become visible. The Bolts 1st line of offense (MVP), and defense, Kuba/Ranger, are doing the bulk of the work. The 1st line offensively has 37 points and is a combined -5. The Defense has 13 points and is +8 (Kuba +5, Ranger +3). Where the disparity begins is the 2nd line on down. Aside from Richards (5G, 8A, 13P), scoring is minimal. His linemates this season, Hlavac, Ouellet, and Ward each have only 4 points. The glaring stat is defensive. The four forwards are a combined -19, with only Ouellet not registering a minus (+1). The second defensive paring of Lukowich/O'Brien has 3 points and is a combined -15. Also of note is that Boyle is -5 in just 2 games back. On the bright side, Chris Gratton has been a gem of an acquisition. Doing duty on the 3rd and 4th lines, Grats has 3 goals and 3 assists and is a +3. He has had no problem grinding it out in the corners and coming to the defense of his teammates. After last season we beat a dead horse over and over, saying the Bolts needed to sure up their defense, get second line scoring help for Richards and get a legit #1 in net. Of those needs, none were adequately addressed, and now the Bolts are faced with going forward this season having dropped 6 straight on the road, and wondering just how much gas the MVP line will have left in the tank when (if) they start the playoffs. There is a finite amount of time a team has with star players in their prime. If the Bolts don't address their problems , their window of opportunity to make another cup run could be closing soon. (AP) -- Rick DiPietro turned aside 28 shots for his 12th career shutout and added an assist to help the New York Islanders beat the Tampa Bay Lightning 4-0 on Thursday night. 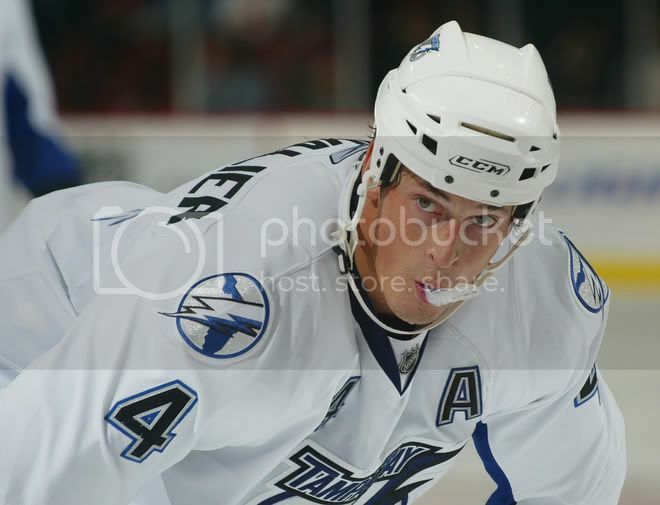 Bill Guerin, Josef Vasicek, Ruslan Fedotenko and Trent Hunter scored for the Islanders, who beat the Lighting for the first time in nine contests (0-5-3), dating back to a 3-0 win at home on March 21, 2004. The Lightning got 28 saves from Marc Denis. Tampa Bay is still winless on the road (0-6-0), and have allowed 28 goals away from home. Mike Sillinger, who played in his 1,000th NHL game, had an assist for the Islanders. What can be said that hasn't already? At least they will be home for the next on against Atlanta. On Halloween night, the Lightning played one scary game. They were trounced by the New Jersey Devils in Newark 6 to 1, giving the Devils their first win in their new arena. The Bolts only goal came in the second from Vinny Lecavalier on the power play. The Bolts seemed to forget to play defense in giving up a hat trick to the Devil's Jay Pandolfo. 'We're embarrassed right now,' Lightning coach John Tortorella said. "It's really frustrating," Lightning forward Martin St. Louis said. "It deflates you. We're saying the same things over and over. We've got to be sharper. We're trying to find a way to win a game on the road." "While we're trying to generate offense, we're forgetting about defense," he said. "It's got to be the other way around. We've got to just play a good, solid defensive game and then, I think our offense will come back to us." Let's hope the Bolts actually show up on the Island tonight. Marc Denis will start in goal, and Adreas Karlsson looks like he will replace Darche in tonights lineup against the Islanders.